Karli Ricketts winds up for a pitch. Ricketts picked up the win in Butler’s victory over Fort Wayne. Photo by Jimmy Lafakis. The Butler softball team moved to 14-22 with a 3-2 win over in-state foe Fort Wayne on April 11. After defeating Evansville and IUPUI in previous weeks, it was the third win in the Bulldogs’ last four midweek games. They overcame struggles at the plate to manufacture what eventually were a pair of winning runs in the fifth inning. “We definitely came out slow in the first couple of innings with our hitting but all we needed was to tie a couple runs together to as the game went on,” freshman infielder and pitcher Karli Ricketts said. Madi Christiansen’s sac fly into center field gave Butler a 2-1 lead over Fort Wayne. Jenna Foreman snuck home for the final run as Emma Morton was caught in a rundown. As the wind blew in from centerfield at Butler, all five pitchers in the matchup held the teams to just four hits a piece. 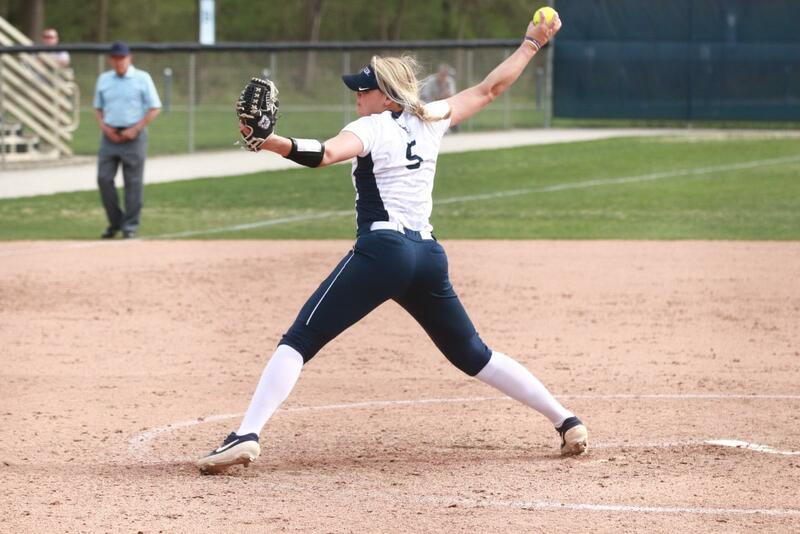 After Fort Wayne took a 1-0 lead off an Alyssa Graves error in the second, Mastodon’s starter Lauren McConnell took a no-hit bid into her fourth and final inning of work. Butler did not have a base runner until a throwing error put Alyssa Garcia on base in the third inning. The Bulldogs struggled to get a ball out of the infield until singles from Christina Candotti and Sammy Andersen in the fourth inning. Andersen’s base hit into center field brought in courtesy runner Sydney Kempf and tied the score at one. Graves and Ricketts split action in the circle for the Bulldogs. Graves pitched 4.0 innings while striking out four batters and allowing just two hits. Ricketts continued a recent trend and was once again solid for the Bulldogs in the circle. She pitched up the win after three relief innings and allowing a sole earned run in the sixth inning. Through Ricketts’ last three appearances she has allowed just two earned runs and struck out 16 batters in 16 innings. She earned the win in all three of those appearances. Butler will host Georgetown for a three-game series April 13 and 14. Thunderstorms are expected for the series finale on Sunday.